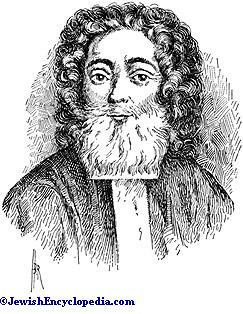 Haham of the Sephardic congregations in London and Amsterdam and follower of Shabbethai Ẓebi; born in the Orient 1664 (1660 ? ); died in Amsterdam April 10, 1728. His name is derived from a town in the Spanish province Segovia of the name of Ayllon. Ayllon was neither a general scholar nor a Talmudist of standing, as his responsa (found in Ezekiel Katzenellenbogen's "Keneset Yeḥezkel," Nos. 3, 5; in Samuel Aboab's "Debar Shemuel," Nos. 320, 324; in Ẓebi Ashkenazi's "Ḥakam Ẓebi," No. 1; in Jacob Sasportas' "Ohel Ya'aḳob," No. 64) amply show. See also the anonymous letter quoted by Grätz, "Geschichte," x. 482 (3d ed.). But his history is closely interwoven with that of Shabbethaism in both the East and the West. Ayllon's youth was passed in Salonica, which was probably his birthplace, although some persons assert that Safed was the place, because many Shabbethaians claimed to be of Palestinian birth. He associated with the Shabbethaian circles of Joseph Philosoph, Solomon Florentin, and other leading spirits of antinomian and communistic tendencies. There he is said to have married as his divinely appointed spouse a woman from whom another man had separated without the formality of a divorce, only to experience that she soon left him for a third spouse, whose "affinity" seemed holier to this strange sect than the bonds of lawful matrimony (M. Ḥagis, "Shebeṭ Posh'im," 34; the passage is, however, somewhat obscure). A few years later he visited Europe as a "meshullaḥ" (messenger) from the Palestinian congregations to collect funds for the poor of the Holy Land, leaving his wife and children domiciled in Safed, and having apparently publicly broken with Shabbethaism. From Leghorn, where he was in 1688 (Aboab, l.c. 329), he repaired to Amsterdam and thence to London, where, after a few months' stay, he was appointed haham June 6, 1689. The very next year, however, he was vigorously attacked by a member of the congregation, named Ruby Fidanque, who had heard something of Ayllon's antecedents. The Mahamad, caring more for its dignity than for the truth, endeavored to suppress the scandal, but Ayllon's position was so hopelessly undermined by the exposure, that all the really learned members of the congregation would not submit to the new haham, which caused considerable friction, in spite of a pronunciamento ("haskamah") issued by the Mahamad that under penalty of excommunication it was forbidden "to any one except the appointed haham to lay down the law or to render any legal decision." Ayllon, in a letter to Sasportas ("Ohel Ya'aḳob," No. 69) six years later (1696), still complained bitterly of the unbearable relations between him and his congregation, and inasmuch as his olden Shabbethaian proclivities began to reassert themselves, and the congregation just then began to consider the propriety of asking for his resignation (M. Ḥagis, l.c. ), he resolved to leave London, and was glad to accept an appointment as associate rabbi of the Sephardic congregation of Amsterdam, 1701. Ayllon's first blunders in his new home took place when in 1700 he pronounced as harmless a heretical work by M. Cardozo (probably the work "Boḳer Abraham," still extant in manuscript), which he had been requested to examine by the Mahamad. This latter body, however, was somewhat distrustful of its ḥakam, and sought additional opinions from other learned authorities. They gave as their opinion thatCardozo's work merited public burning, and this sentence was actually carried out. About this time, too, Ẓebi Ashkenazi came to Amsterdam as rabbi of the Ashkenazic community; his advent was a serious matter to Ayllon, as the former completely eclipsed his Sephardic colleague by his superior learning and dignity of character; he was also a noted heresy-hunter in the matter of the Shabbethaian movement. The clash could hardly have been averted, and Nehemiah Ḥayyun, a notorious Shabbethaian, precipitated it. At the request of M. Ḥagis, Ashkenazi examined the works of Ḥayyun (1711) and rightly denounced them as heretical; in addition, he notified the Mahamad of the fact. This august body, however, did not exactly welcome advice volunteered by a Polish-German rabbi, and replied that, before taking action, Ashkenazi's opinion would have to be fortified by the assent of Ayllon and other members of their own body. Ashkenazi peremptorily declined this express invitation to sit in council with Ayllon, for he was well aware both of his ignorance of the Cabala and of his suspected affinity with Shabbethaism. Ayllon saw in this crisis an opportunity to make political capital. He persuaded an influential member of the Mahamad, a certain Aaron de Pinto, to take up the matter as an attempt on the part of the German rabbi to interfere with the autonomy of the Sephardic community. It is difficult to discover whether Ayllon was actuated herein by secret loyalty to Shabbethaism, or whether, for personal reasons, he merely sought to clear Ḥayyun from the imputation cast upon him. The adventurer was well acquainted with Ayllon's antecedents, and it would have been dangerous to make an enemy of him. Be this as it may, De Pinto succeeded in having a resolution passed by the Mahamad, declining to permit any such interference in their affairs by the German rabbi, and requesting Ayllon to appoint a committee to give an official opinion upon Ḥayyun's work. The finding of this commission was publicly announced Aug. 7, 1713, in the Portuguese synagogue, and it ran that Ḥayyun was innocent of the heresy charged against him, and that he had been unrighteously persecuted. The committee consisted of seven members, but its conclusions represented simply Ayllon's opinion, for the other six understood nothing of the matter. The affair, however, could not be considered closed herewith, for Ashkenazi and Ḥagis had already, on July 23, pronounced the ban of excommunication upon Ḥayyun and his heretical book. 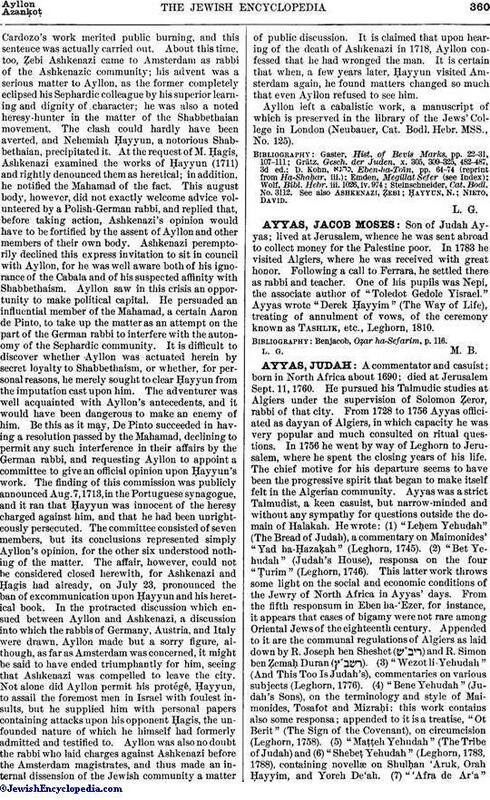 In the protracted discussion which ensued between Ayllon and Ashkenazi, a discussion into which the rabbis of Germany, Austria, and Italy were drawn, Ayllon made but a sorry figure, although, as far as Amsterdam was concerned, it might be said to have ended triumphantly for him, seeing that Ashkenazi was compelled to leave the city. Not alone did Ayllon permit his protégé, Ḥayyun, to assail the foremost men in Israel with foulest insults, but he supplied him with personal papers containing attacks upon his opponent Ḥagis, the unfounded nature of which he himself had formerly admitted and testified to. Ayllon was also no doubt the rabbi who laid charges against Ashkenazi before the Amsterdam magistrates, and thus made an internal dissension of the Jewish community a matter of public discussion. 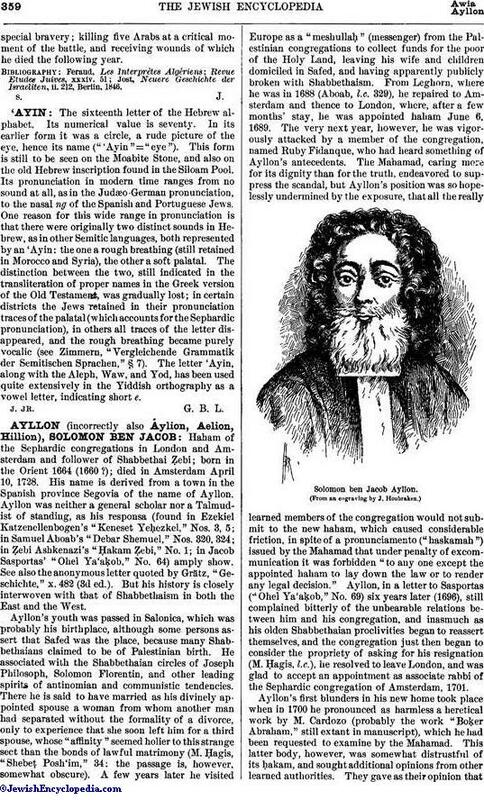 It is claimed that upon hearing of the death of Ashkenazi in 1718, Ayllon confessed that he had wronged the man. It is certain that when, a few years later, Ḥayyun visited Amsterdam again, he found matters changed so much that even Ayllon refused to see him. Ayllon left a cabalistic work, a manuscript of which is preserved in the library of the Jews' College in London (Neubauer, Cat. Bodl. Hebr. MSS., No. 125). Steinschneider, Cat. Bodl. No. 3112. See also Ashkenazi, Ẓebi; Ḥayyun, N.; Nieto, David.